Mozart and Da Ponte's first thoughts reconstructed in this engaging performance which reverses the plot. In 1785, Salieri wrote an opera La grotta di Trofonio, in which two couples end up swapping partners temporarily. The tone is resolutely light with the results sometimes closer to farce. It is pertinent that Salieri had worked with Lorenzo da Ponte in 1784 but they had fallen out. There exists a sketch for Cosi fan tutte in Salieri's hand, as if he was trying out the opera. 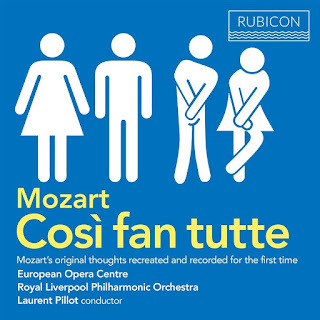 As we know, it never came to anything and it was Mozart and da Ponte who brought Cosi fan tutte to fruition, with its swapping of lovers in a way which lifts the emotional temperature far above Salieri's La grotta di Trofonio. But it wasn't always certain that that is what would happen. New research by Ian Woodfield, Professor of Historical Musicology at Queen's University Belfast, has uncovered a more intriguing history for the composition of the opera. Whilst Mozart and da Ponte were working on Act One, before the discarding of Guglielmo's aria 'Rivolgete a me', the manuscript had gaps for pronouns which were inserted later. In fact the aria seems to have gone through both pronouns 'me' and 'lui'. Woodfield has come to the conclusion that when initially working on the piece, Mozart and da Ponte were uncertain which lover went with which when the seduction happens. This has interesting repercussions. With the men, in disguise, wooing their original lovers the ending becomes far less problematic, but the temperature of the opera is lower and rather closer to Salieri's La grotta di Trofonio. It is only with the men wooing the other's lover, and becoming competitive about it that Cosi fan tutte gains that element of gut wrenching emotional turmoil at the centre of Act Two. And it is worth bearing in mind that the opera has autobiographical links to Mozart's own life. He fell in love with Aloysia Weber, yet married her sister. 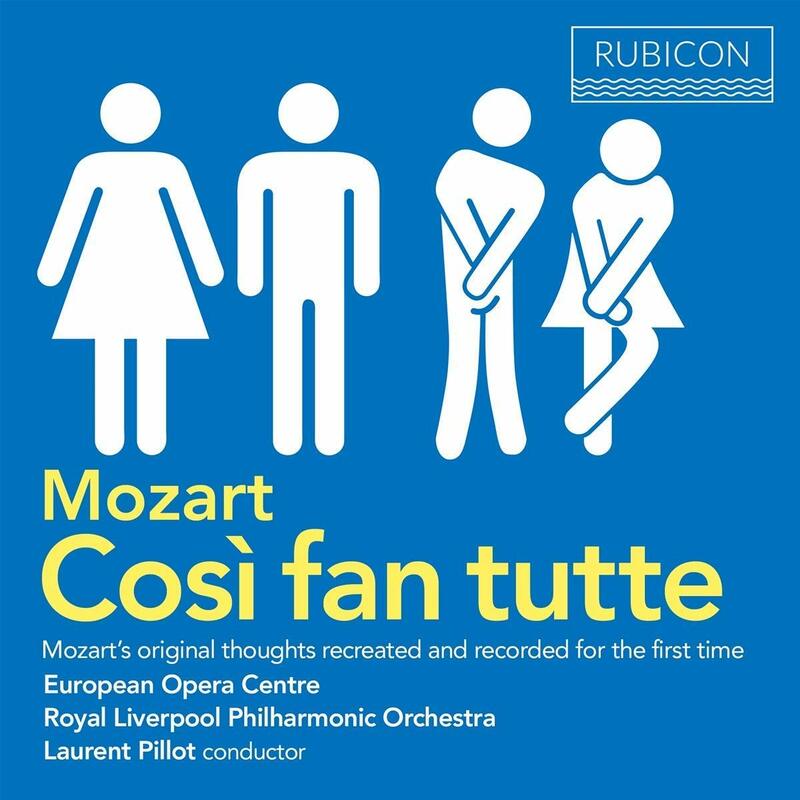 On this disc from Rubicon Classics, the European Opera Centre and the Royal Liverpool Philharmonic Orchestra, conducted by Laurent Pillot, we have an attempt to bring to light Mozart and Da Ponte's first thoughts with a talented young cast, recorded live. Nazan Fikret is Fiordiligi with Heloise Mas as her sister, Alexander Sprague is Ferrando with Biagio Pizzuti as Guglielmo, Hamida Kristoffersen is Despina, with Francesco Vultaggio as Don Alfonso. So what do we hear? Act One is pretty much as written, except Guglielmo gets 'Rivolgete a me' and a few pronouns are adjusted. In Act Two, the cuts are pretty substantial and we lose a lot of the more taxing elements of the plot, though Guglielmo's 'Donne mie' is transferred to Don Alfonso. The results work, because Laurence Pillot draws such engaging performances from the young cast. Nazan Fikret and Heloise Mas make a characterful and nicely differentiated pair of sisters. Nazan Fikret might have quite a light lyric voice, but she makes a fine go of 'Come scoglia' and is moving in 'Per pieta', with Heloise Mas bringing strong character to her aria 'Smanie implacabili'. Alexander Sprague and Biagio Pizzuti make a lively pair of lovers. Pizzuti brings a nice warm tone and sense of character to 'Rivolgete a me', whilst Alexander Sprague sings 'Un aura amorosa' with a fine sense of line. Francesco Vultaggio is a young sounding, nicely swaggering Don Alfonso and brings off 'Donne mie' in bravura fashion. Despina loses her aria in act, but Hamida Kristoffersen makes her vivid and suitably perky with a lively account of 'In uomini, in soldati'. But, more than these details of individual arias, it is the vividness of the overall performance and the sense of strong interaction between the characters which really engages. The recitative really does feel like dramatic dialogue, ably supported by Daniela Candillari's forte piano. Under Laurent Pillot's direction, the Royal Liverpool Philharmonic provide lithe and lively orchestral contributions which complement the engagingly youthful performances. This could have been a rather dry, academic exercise but all concerned bring the opera vividly off the page.